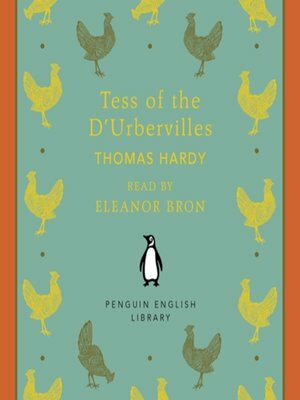 Penguin Classics presents Thomas Hardy's Tess of the D'Urbervilles, adapted for audio and available as a digital download as part of the Penguin English Library series. Read by Eleanor Bron. "I would be content, ay, glad, to live with you as your servant, if I may not as your wife; so that I could only be near you, and get glimpses of you, and think of you as mine ... I long for only one thing in heaven or earth or under the earth, to meet you, my own dear! Come to me - come to me, and save me from what threatens me! "When Tess Durbeyfield is driven by family poverty to claim kinship with the wealthy D'Urbervilles and seek a portion of their family fortune, meeting her 'cousin' Alec proves to be her downfall. A very different man, Angel Clare, seems to offer her love and salvation, but Tess must choose whether to reveal her past or remain silent in the hope of a peaceful future. With its sensitive depiction of the wronged Tess and powerful criticism of social convention, Tess of the D'Urbervilles is one of the most moving and poetic of Hardy's novels.Part of a series of vintage recordings taken from the Penguin Archives. Affordable, collectable, quality productions - perfect for on-the-go listening.